If you’re interviewing for HR Coordinator jobs or other similar HR jobs, you’ve come to the right place. We’re going to look at the top HR Coordinator interview questions and how to answer them to get hired! You’ll hear questions like, “why are you applying for this position?” and, “why do you want this job?” in any interview, and HR job interviews are no different. They’re going to want to know that you’ve done your research, read the job description carefully, and have specific reasons for why you want this. There’s no “right” answer for why you want to be an HR coordinator but you do need some type of reason. You could say a friend works in HR and said it’s a great career. Or you can say you enjoy working with people and you’ve always been good at listening to others, coming up with solutions, working with a variety of different personalities, etc. You could also say a former boss, colleague, or mentor recommended it. Just make sure you have something prepared to say for this type of HR interview question. You should be ready to show the employer that you’re applying for multiple HR jobs, not just one. This will put their mind at ease and show them that HR is really what you want to be doing! Their main fear here is that you don’t know much about what an HR coordinator job involves, and will not like it (and leave quickly after being hired). For example, if you’ve applied for 10 marketing jobs and just one HR Coordinator job, they’re really going to wonder if this is something you want to do, and why you applied. Employers love to ask, “what other jobs are you applying for?” or “what other companies are you interviewing at?” to diagnose this and see if you really know what you’re getting into! So be ready to show that you’re really looking for HR Coordinator positions in particular. Hiring and training you costs a lot of money, so expect multiple questions about this topic in any HR Coordinator interview. Another way employers see if you really know what you’re getting into, and check whether you are really going to like this job and stay, is to ask about the job requirements. Stay calm and don’t panic here. This DOESN’T mean they think you’re a bad fit. It just means they want to know what you saw and what you think! Be confident and be ready to show them you know what the job involves and are ready to put in the effort to succeed. Study the job description before going into any HR Coordinator interview so you can talk about specific points you read on the job description (and how you fit those points). Here’s a full job prep checklist if you want to know what else I recommend doing besides practicing questions and answers. You should expect HR Coordinator interview questions about how you communicate, and your personality overall. Don’t feel pressure to be fake or dishonest, but do make it sound like you enjoy working with others. Otherwise, you’re really not going to enjoy an HR job anyway. There’s often a lot of communication involved, whether it’s on the phone or in-person (most HR jobs involve a lot of in-person). Try to give examples of how you’ve communicated effectively with different types of people, too. Show how you’ve used clear communication to solve problems in past jobs. Next, employers will want to know how you handle deadlines. This is very important for an interviewer to know before hiring you for an HR Coordinator role (or any coordinator role). Being a coordinator for a department can be stressful and you’ll often have multiple projects, each with a deadline. So you want to show employers that you’re battle-tested and you’ve worked under tight deadlines before. Be ready to talk about how you’ve juggled multiple projects, prioritized things, communicated clearly with multiple people/groups… all to get a great outcome or result on the project! Ideally, try to have one or two specific examples ready from past jobs. If you’re looking for a job with no work experience, come up with an example from your academic work. Since HR Coordinator is an entry-level job typically, or near entry-level, employers will want to know where you see yourself in a few years, too. Most companies want to hire people who are eager to learn and grow with the organization. Be prepared to show them you want to progress and grow, and that you don’t plan on being an HR Coordinator forever. You can say your goal is to learn HR and then advance to a higher level role in the company, still within HR. If you’re already in HR you can say your goal is to build out your HR skills further and then advance in the future. Along with the HR Coordinator interview questions above, there are some questions all employer love to ask… no matter what type of job you’re interviewing for. And be sure you have great questions to ask the interviewer, too. That’s just as important as your answers to their questions. I explain why in that article linked above. If you don’t ask good questions, they’ll think you don’t really care which job you accept, and they will NOT want to hire you. 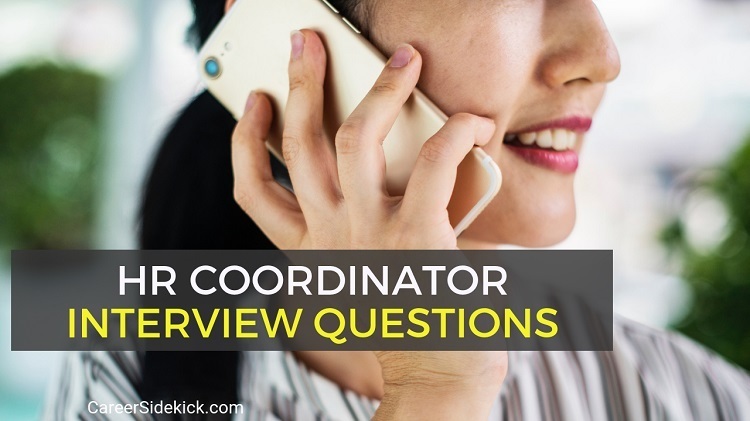 Prepare great questions to ask the interviewer at the end of your HR Coordinator interview. This matters more than most job seekers realize! The post Top HR Coordinator Interview Questions and Answer Tips appeared first on Career Sidekick.